This book is designed for Christian parents and families, Christian schools, and those who work with young children in Christian schools, daycare centers, and churches (Pastors, Children’s Pastors, Sunday School teachers, and Preschool teachers). When his Grandfather died, 3-year-old Little Dave did not understand what “died” meant or where Grandpa had gone. 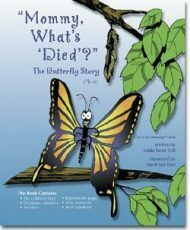 The story traces his experience following a death in the family and illustrates how his mother sensitively answered his questions about death by using simple examples derived from the birth of a butterfly. Little Dave’s story is colorfully illustrated and designed for a child and parent or trusted adult to read together. 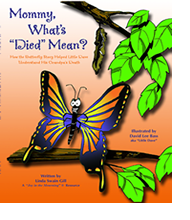 Based on a true story, this book is designed to assist Christian parents and other adults who love and care about children to talk about the difficult subject of death. Discussion questions are included for each story page to help you determine how much the child understands. A simple imitation game is included to help involve the child in the story. 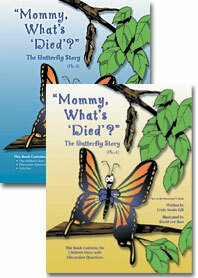 There are also specific pages that explain how children understand death at different ages and stages of development. This information can be valuable as parents make decisions about whether the child is old enough to participate in a funeral or a memorial service. The story has been created especially for children from pre-kindergarten through fourth grade. Click here to order. These two books have been designed for non-religious settings to help children (pre-kindergarten through 4th grade) from various religious or cultural backgrounds. There is a Professional Extended Edition (the blue book) and the Storybook Version (the yellow book). They are especially useful for professionals who work with young children in hospices, public schools, funeral homes, nursing homes, and hospitals. Each unique book contains the same heartwarming, sensitive, colorfully-illustrated story about death, grief, loss, and joyful memories. The story traces Little Dave’s experiences following the death of his grandfather. 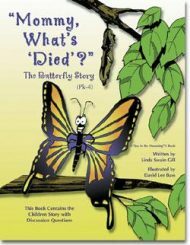 As he learns about the birth of a beautiful butterfly, Little Dave gains a new understanding about death and loss that is free from fear and worry. Available separately or as a two-book package. Click here to order 2-book package. This Extended Version of the book is full-color and is intended for professionals who work with young children (counselors, social workers, teachers, childcare workers, chaplains, and medical or nursing professionals) who would like a more in-depth resource. In addition to the illustrated story, it includes more than 50 additional pages of Activities, Optional Story Extensions, and Cultural/Family Belief Variations to assist professionals as they support the grief processes of children from various cultural and religious backgrounds. The Activities section can be used to help children explore their feelings. The Story Extensions section provides examples of ways to adapt and extend the story for children from differing cultural or religious backgrounds. The Family Belief Variations section provides information to help professionals become more knowledgeable and sensitive to different beliefs, customs, and rituals that children from different cultures and religions will experience after a death. Click here to order. The Children’s Storybook is the full-color, illustrated story intended to be read to the child by a trusted adult. It includes discussion questions on each page to help enable the adult and the child to talk together about the story, and the adult to determine what the child understands. It makes a wonderful gift or can be loaned to families with children who have experienced the death of a loved one and come from differing cultural or religious backgrounds. Click here to order.